Wyandotte County – Page 1420 – Welcome to Wyandotte Daily! High temperatures will rise into the 90-95 degree range today through the weekend, according to the National Weather Service. Although the temperatures themselves are not dangerous, this is the first hot stretch of the season and it can sneak up on people, the weather service said. People should stay hydrated, wear lightweight clothing, and take frequent breaks in air conditioning. Sensitive individuals, such as the elderly and children, should be monitored as well as pets, according to the weather service. 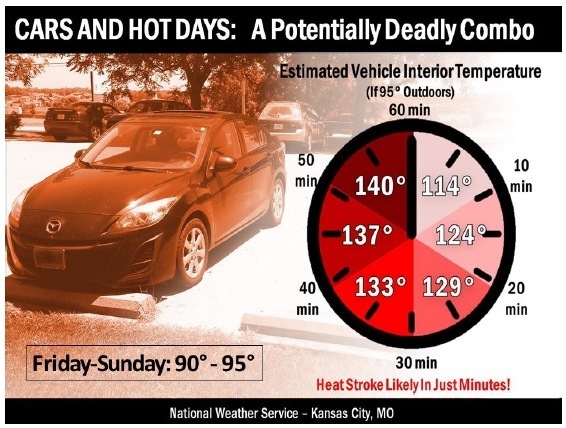 Do not leave children or pets in cars for even a short time as heat stroke can occur in minutes, the weather service said. The warm weather will last until Sunday or Monday. Storms will return Monday and Tuesday and severe weather may be possible with these storms, according to the weather service. Today’s forecast is sunny and 92-degree. A south southwest wind of 10 to 15 mph will gust as high as 22 mph, the weather service said. Tonight, the low will be around 72. Saturday, expect sunny skies with a high near 92, and a heat index of 96, the weather service said. A southwest wind will be 9 to 13 mph. Saturday night, the low will be 73. Sunday, it will be sunny with a high near 92, and a south southwest wind of 7 to 13 mph, according to the weather service. Sunday night, the low will be 73. Monday, there will be a 50 percent chance of storms and showers, and the high will be near 89, the weather service said. Monday night, there is a 60 percent chance of showers and thunderstorms, with a low of 72. The Unified Government Commission tonight approved a $310.5 million industrial revenue bond issue for a large industrial project on the Turner Diagonal near Riverview Avenue in Kansas City, Kan. It will house an online sales fulfillment business, developers said tonight, although they did not mention the future tenant’s name. The location is 130 acres south of I-70 on the Turner Diagonal corridor with access off Riverview Avenue and potential access off 65th Street, according to UG officials. It is located on rocky ground. The project is now called RELP Turner LLC, and previously a different commercial-industrial development plan was approved last year at the site, according to UG officials. The building now has a total of around 2.3 million square feet available in a single building, and includes a mezzanine area that expands the 856,000-square-foot area on the first floor. A previous plan from NorthPoint Development called for three smaller buildings at the site. Jonathan Stites of Seefried Properties in Dallas, Texas, is managing the construction phase of the new proposal. The new owner of the development will be USAA Real Estate Co. of San Antonio, Texas, and they have a tenant in mind, said George Brajkovic of the UG’s economic development department. Besides approving the $310.5 million resolution of intent to issue industrial revenue bonds, the commission amended and assigned the development agreement, and terminated the previous community improvement district. The previous three-building project would have created about 600 new jobs, but this project would create more than 1,500 new jobs, according to Brajkovic. The building should be built within one year, he said, and there is a Kansas Department of Transportation grant of $7 million to redo the area infrastructure around the building. The project has a 100 percent abatement. There will be a payment in lieu of taxes of $5,000 a year for 10 years. The project has a local, women and minority business enterprise provision, with a $1.68 million payment if goals are not met. Also, if there are not 1,000 jobs provided for 15 years, there will be a payment of $1.5 million, according to Brajkovic. Brent Miles of NorthPoint Development said it was a unique circumstance. But when they heard about the project parameters, they changed their minds, he said. “This is a big project for your community, obviously it’s beneficial to us in a sale as well, but this is a big deal, when you look at the scale of a $300 million-plus project,” Miles said. He said calling the ground a “goat path” was an exaggeration of how good the site was. “There’s 30 to 38 feet of cut and fill across the site. We’re moving just under 1 million cubic yards, one of the largest dirt-moving projects,” Miles said. Jonathan Stites of Seefried Properties in Dallas, Texas, said they have done several projects like this in the past several years. The building will serve the user as a great opportunity to generate commerce for the area, he said. It will have a lot of employees and some high-tech operations inside. The mezzanines will be for a lot of that high-tech, and material handling equipment, he added. Greg Kindle of Wyandotte Economic Deveopment Council recalled planning for a development three years ago. The project was fast-tracked from a Monday night, June 6, standing committee meeting. Developers then said the reason they wanted it advanced quickly to Thursday night’s agenda was that they were trying to meet building deadlines, trying to get the building finished. RELP Turner LLC, a real estate investment company, was registered as a limited liability company in the state of Delaware on June 1, 2016, when it was incorporated, and paperwork as an out-of-state corporation also was filed in Topeka on the same date. It lists its resident agent as Peggy Siefkin of San Antonio, Texas, at the same address as the USAA Real Estate Co.
Civic organizations helped Wyandotte County and Kansas City, Kan., become what it is today. Remember the days when belonging to a city organization such as the Jaycees, the Kiwanis, or the Rotary and Optimists was the thing to do? To belong to these organizations would give you not only civic pride but also make you better known as well. One organization I belonged to was the Kansas City, Kan., area Jaycees. This organization at one time had well over 350 members. At the time I belonged to the organization it was for men only. The women’s organization was called the Jaycee Jaynes, including the wives of the men in the organization. I can remember the day when we would sell peanut butter at various locations to help a Kansas Jaycees benefit project. One member who recently died, S.G. Jackson, would encourage me to go beyond my expectations. S.G. Jackson at one time ran for county commissioner. When I joined the organization I was very shy and timid and did not understand what was around me. S.G. Jackson and his family helped me to grow. Within the organization they offered leadership training courses and public speaking courses as well encouraged me to compete with others so my communication skills could be well defined. This is right before I went back to college to get my degree. S.G. Jackson was a rare breed, highly outspoken and highly driven. He loved politics and he loved his community as well. He donated a lot of time and effort into the community. He worked long hours on Jaycees projects that would benefit Kansas City, Kan., as a whole. The Jaycees at that time were known for building future leaders A lot of great leaders were developed by the Kansas City, Kan., area Jaycees such as former Bert Cantwell, former head of the Kansas Highway Patrol, and Mayor Jack Reardon, just to name a few. In this organization blue-collar workers or businessmen or lawyers could join to learn leadership skills and do things for the community. They would have conventions on the state level of 300 to 500 young men. Their creed is what they lived by. It is very simple. It emphasized faith in God and service to humanity. Now things are changed. Young people in today’s society don’t have organizations like this. When I talked to the executive director of the U.S. Jaycees he told me they only had 1,300 national members and the convention’s national level will have 300 people. In the past U.S. Jaycees would have a convention that would have well exceeded over 800 people from all 50 states. Sometimes I wonder if we could go back to the good old days but I do understand why it is different. Our society is a lot different. I’m not saying that people do not care. But I am saying we need organizations as the Jaycees, Kiwanis and the Rotary, just to name three, to be within the community to help make it grow. My hat goes off to those of you who believe in the same philosophy as I do. My hat also goes off to my deceased friend, S.G. Jackson who died on June 2, 2016. My prayers and sympathy go out to his family. To the former members of the Kansas City, Kan., Jaycees, both living and dead, I tip my hat to you as well. I also tip my hat to members of the Kiwanis, the Optimists and the Rotary and other civic organizations within our community. I want to thank them for what they are doing and have done in the past for our community. These fond memories of my friendship with S.G. Jackson will always be with me. He played a major role in my life and so did his family as well. I also want to thank other people in other organizations like Jaycees for volunteering and helping out in our great community. It’s people like S.G. Jackson and other people within our community who donate their time to make the community a better place to live.